Multidev Technologies Inc., a recognized industry leader in the development of retail technology software announces the addition of a new solution component, Integrated Internal Messaging (IIM) to its ChainDrive Unified Commerce Platform. “In our daily personal lives we’re all connected through conversation, so we decided to bring that level of comfort into the workplace,” said Joseph Amzallag, President, Multidev Technologies Inc. The new component is developed to offer retailers a seamless and transparent way of communicating with their entire staff throughout the enterprise via internal messaging. Completely integrated to the ChainDrive software it eliminates the need for any external applications. ChainDrive IIM supports retail employees across all channels in real-time from head-office right down to the storefront point of sale. 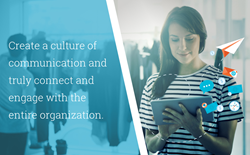 With ChainDrive IIM, retail executives and store managers will have the power to communicate to all, or segment using specific channels and groups of employees simultaneously. This communication tool will allow for the exchange of pertinent operational information such as; price changes, promotions, inventory, invoices, po’s, customer purchase history, customer profiles and more directly to the specified mail recipient(s). In turn, store associates will be able to guide, support and better serve their customers throughout their shopping journey by providing highly personalized and intelligent interactions. Leveraging messages anytime and anywhere will not only improve operations throughout the enterprise it will also enhance associate product knowledge, drive instore efficiency and ultimately heighten customer engagement. Triggered messages such as client pick-up in store or ship from store are automatically initiated and sent to the appropriate recipient complete with links to the transaction and item details.